Ella Rhodes reports on highlights involving the British Psychological Society. 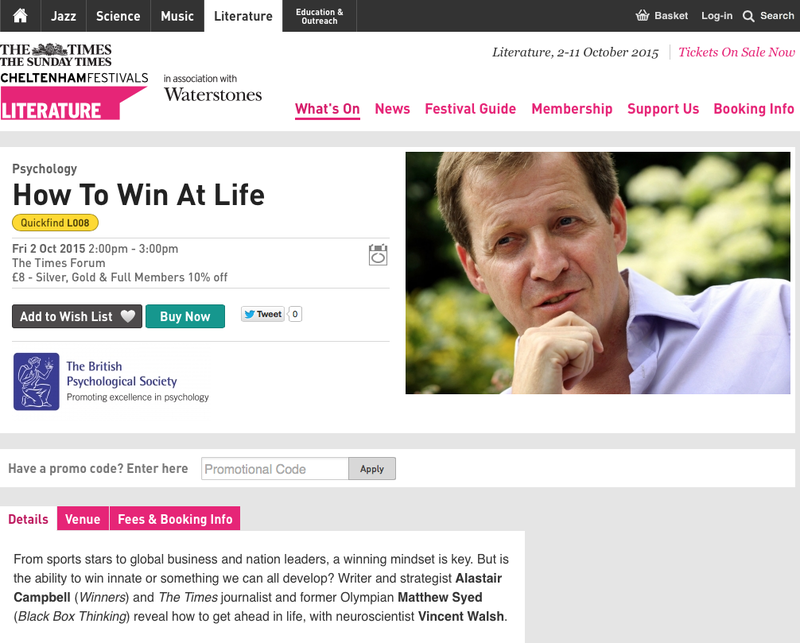 Alastair Campbell will be among the authors interviewed by eminent figures in psychology and neuroscience at BPS-supported events at the Cheltenham Literature Festival. We spoke to some of the speakers as well as the psychologists who will be interviewing them. Campbell, the former Director of Communications for Tony Blair, will be interviewed by Vincent Walsh (University College London) about his new book Winners and how they succeed. Campbell told The Psychologist that he had a great fascination with the workings of the human mind. He said he had been previously inspired after speaking with a psychiatrist at a National Theatre event. Professor Kevin Dutton (University of Oxford), will be interviewing journalist Åsne Seierstad whose book One of Us explores Anders Behring Breivik, the Norwegian mass murderer who killed 77 people in two terrorist attacks. Dutton said he was hoping to speak to Seierstad about several main areas, including a general view of who Anders Breivik is, whether he is sane, what triggered his murderous spree and what similarities he shows with other mass murderers. I The Cheltenham Literature Festival runs from 2 to 11 October.